A cover-shooter with elements of Uncharted, bullet-time and a neat TV show hook. Quantum Break may not be groundbreaking, but it sure looks fun. Despite the fact I’ve been sat down in a trade show meeting room and shown around Quantum Break before, I still didn’t quite know what to expect as I arrived to see the latest demo of the game, now dated for April 2016. Most of the gaps in my knowledge came in the form of the title’s TV-style tie-in, which it turns out will ship together with the game and will serve to complement the game’s narrative by displaying events from a different point of view. Remedy was thankfully able to clear that up – and quite a bit besides – in the little under a half an hour I had with it and its new big bet. Running on a PC but inside an ‘Xbox One Development Environment’ (with a turned-off Xbox One sitting just below the TV as if to underline the point), Quantum Break is now at the point where it’s playable from start to finish, with the studio focused on the polish needed to get it running on more final Xbox hardware. Those familiar with Remedy’s work on the likes of Max Payne and Alan Wake should be well aware of what to at least partially expect from Quantum Break – tightly-wound, high-octane third person shooting action wrapped around a storyline with strong filmic ambitions – but if I had to pick out one thing that sets it apart from those titles, it’s what happens between the story and the shooting. When Alan Wake first began development the revelation of Uncharted and its sequel was still a while off, even though Alan Wake’s rather iterative development meant both those titles launched before it did. The flow of Quantum Break, at least in this demo, felt decidedly Uncharted to me: story sequences followed by traversal action followed, of course, by a whole lot of shooting. This isn’t unique to Uncharted, of course, but the pacing of the level I saw felt more like that series than anything else. In this demo protagonist Jack Joyce finds himself in a shipyard as a grounded ship falls apart around him. 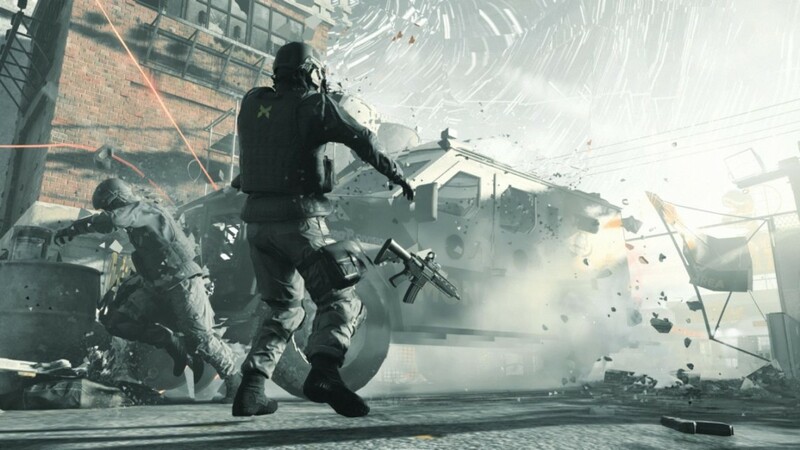 What sets Quantum Break apart is its time-bending mechanics, and in this instance a rupture in time means that the same few destructive moments of this ship searing in two were playing out over and over again, with time rewinding back and then playing again around the player. The end result makes for an interesting traversal section: gigantic shipping crates are clattering to the ground and then floating back upwards, thus forming platforms for Jack – but only for the briefest of moments before time shifts again. Jack clambers around the realistic environment to progress, but the time-bending makes the way the level moves vaguely resemble something like 3D Mario’s most abstract action. As well as Jack’s time-based abilities being useful in combat, players must also use them to ‘solve’ traversal problems as well. At one point a perfect Jack-sized gap in the ship wreckage appears but is then quickly closes again thanks to shifting debris. The player must wait for the gap to open once more and then trigger a time dash to shoot through the gap in the short time available. 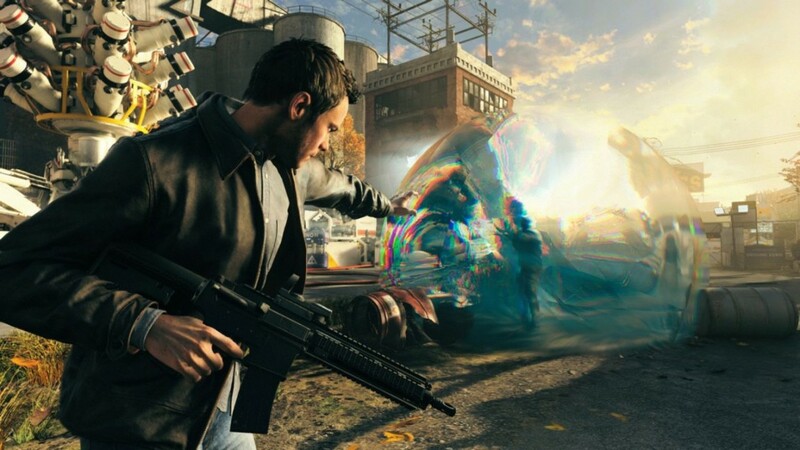 Combat has been shown more heavily and is more familiar all the same – Remedy has always had a taste for bullet time, and one can certainly see the lineage from that to Jack’s abilities, which include a shield-like Time Bubble, an environment-searing Time Blast and, of course, a full-blown Time Stop. Alan Wake felt lacking in combat mechanics as the game progressed, so the addition of truly different skills appears to be a positive. While press weren’t allowed to go hands-on with this particular demo, the combat certainly looked to control in a tight and satisfying manner – and the pedigree of Remedy certainly suggests this will likely be the case. 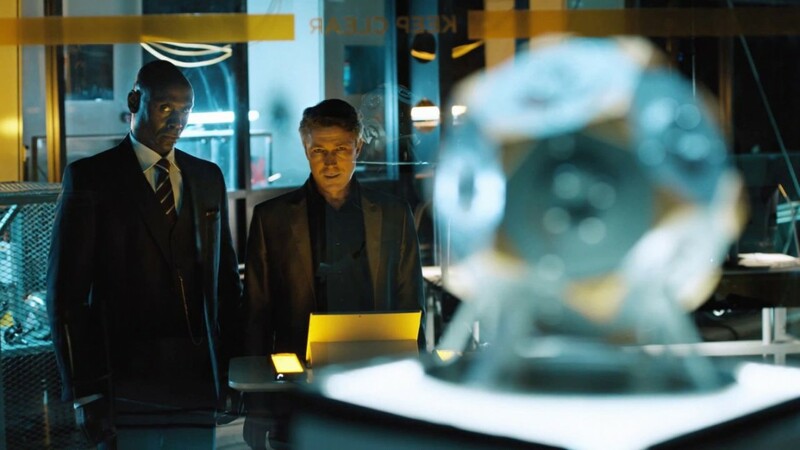 The final piece of the Quantum Break puzzle comes in the form of its TV sequences – around ninety minutes of FMV footage that comes as part of the base game, split into four episodes that are then injected at key points throughout the game’s narrative. 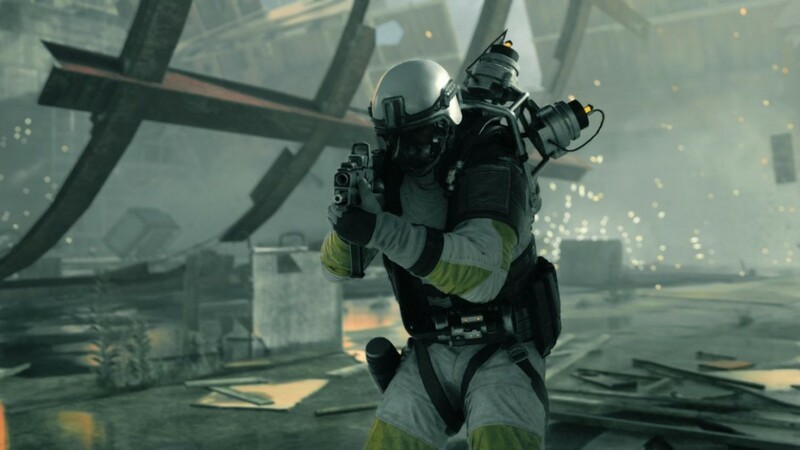 While disinterested players can absolutely skip them, Remedy is quick to note that they consider them a key part of the Quantum Break experience. Microsoft money has helped make Remedy’s vision a reality, with well-known TV and film actors attached to lend their voices and likenesses to the game and play the same characters in the show. The footage we’re shown is of a high quality and could come from just about any prime-time thriller – but the interesting twist comes in how being part of a time travel themed video game allows that medium to do something a little different. Quantum Break’s FMV shows each have triggers in them, I’m told, to adjust and change in response to actions the player takes in the game. It’s like a choose-your-own adventure, except sometimes you won’t even know the consequences of an action until you hit the next episode of Quantum Break’s FMV show. Scenes will often be broadly the same, but the outcome may be completely different. We see one scene from the show twice – one take where a captured woman capitulates to the wishes of the antagonists, the other where she doesn’t and thus pays the price. While several shots between the two sequences are identical, the final outcome couldn’t be more different. Remedy suggest that this character’s status could then come into play later on in the game or show, with choices piling up to make a major difference in how things ultimately conclude for each player. The concept of Quantum Break’s universe is that the game tells the story of hero Jack from his perspective while the show follows the villains and periphery cast more closely, helping expand on their ideals and goals. On occasion the two intersect, with the same scene ultimately shown from two angles – in real-time game cinematics and in FMV. Remedy demo this, and aside from the slight uncanny experience of seeing the same thing back-to-back in reality and digitally – which won’t happen to the average player – it has a solid impact. 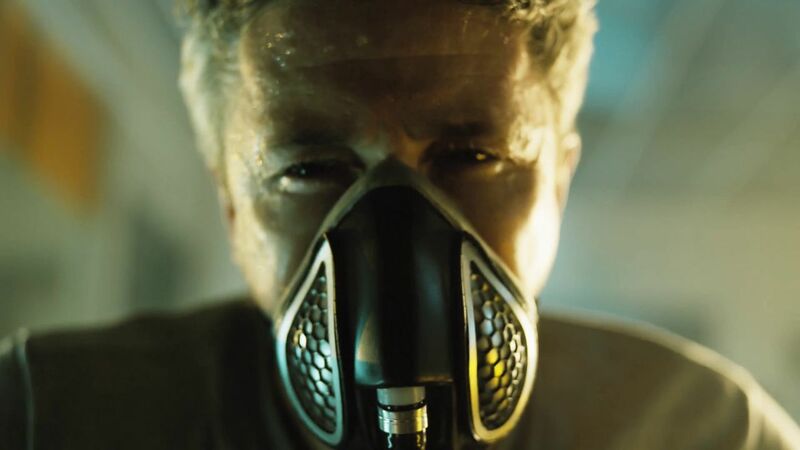 The truth is, Quantum Break’s FMV show currently feels little more than a bonus. I’ve enjoyed Remedy’s previous works tremendously, and Quantum Break seems to pick up all of their tropes – cheesy dialogue and all – and run with it. It feels a successor to Alan Wake in that regard and looks it gameplay-wise too. While the demo suffered some nasty screen tearing and things like the HUD were supposedly unfinished, there appears to be a solid core here that should hopefully polish into something great. While Microsoft and Remedy might have ideas that their TV show/game combination might prove to be something truly revolutionary, I rather doubt that – a doubt only increased when you consider it was demoed right next door to Crackdown’s crazy new destruction tech and Scalebound’s interesting new take on the JRPG. What it has done, however, is give Remedy a chance to expand on the ideas already expressed in their previous works – and I see that as no bad thing. If you didn’t find Alan Wake’s sometimes stifled dialogue to be an annoyance and have enjoyed their previous shooting outings, Quantum Break seems like it’s going to be a solid new take on that formula with some fascinating new wrinkles – but only hands-on time will truly tell. Hopefully we get that soon.